Birds & Breakfast is a monthly event featuring a 3-hour guided birdwatching hike in the Western Area Peninsula National Park, followed by a breakfast of champions in our eco-lodge dining area. It happens on the last Saturday of every month. 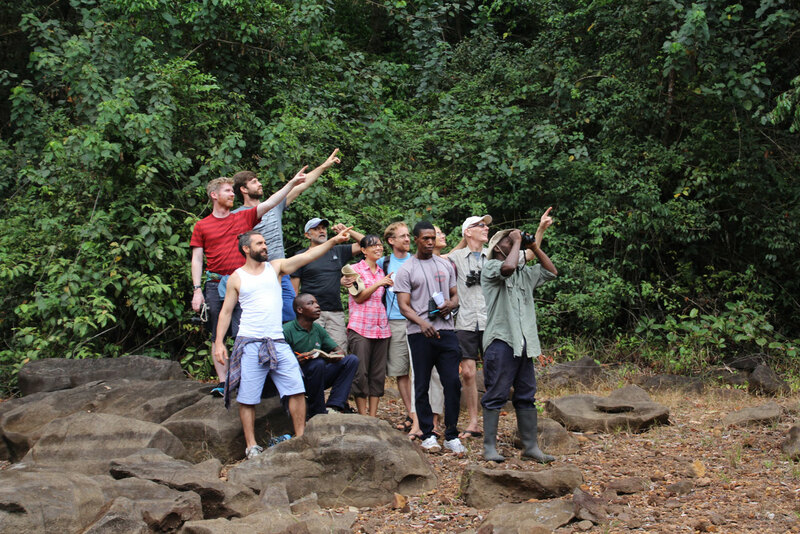 Book a private guided birdwatching tour in the jungle surrounding Tacugama, or add one on to your stay after a night in our eco-lodges. Tours typically begin at 7:15AM in order to catch the best sightings. Birds may include turacos, hammerkops, palm-nut vultures, and more! Guided tours start at 7:15AM and typically last 3 hours. For private bookings, the duration of the tour can be adjusted. Guests typically gather at 7AM and depart at 7:15 for the best bird sightings. Birdwatching is available daily Monday through Saturday. As sanctuary tours begin promptly at 10:30AM, we recommend not expecting to do a birdwatching tour and sanctuary tour on the same day. Tours take place on foot, following forest footpaths and unmarked trails. Please wear comfortable clothing/footwear and remember to bring your rain gear in the rainy season. Tours in the rainy-season will be weather-dependent, as many birds will not be active in the rain. You are welcome to bring your camera as there are good opportunities to take the perfect picture. Bird sightings have included: turacos, hammerkops, palm-nut vultures, honeyeaters. See below for our bird guide. If you would like to combine your birdwatching tour with a relaxing overnight stay at one of our eco-lodges, make sure to check out the lodge information here and contact us well in advance to make your reservation.